Karamata  introduced the (so-called) regularly varying functions (RV-functions) in 1930 and proved a number of fundamental results for them (see also Karamata ). These results and their further generalizations formed the basis of a developed theory with a wide range of applications (cf., e.g., Seneta , Bingham et al. , Alsmeyer , Bingham , Marić , Korevaar , Resnick [300, 302], Yakymiv ). 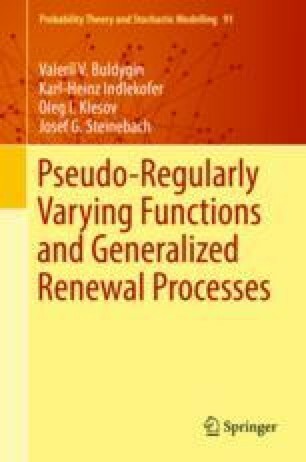 This chapter is devoted to the discussion of certain classes of functions which generalize, in one way or another, the notion of regular variation. Additionally to the classes RV and ORV of functions, an important place in the theory is occupied by the classes PRV, PI, SQI, and POV. The main attention in this chapter is paid to these four classes.